Vermicomposting is a type of composting in which certain species of earthworms are used to enhance the process of organic waste conversion and produce a better end-product. It is a mesophilic process utilizing microorganisms and worms. Earthworms feeds the organic waste materials and passes it through their digestive system and gives out in a granular form (cocoons) which is known as vermicompost. Simply speaking, vermicompost is earthworm excrement, called castings, which can improve biological, chemical, and physical properties of the soil. The chemical secretions in the earthworm’s digestive tract help break down soil and organic matter, so the castings contain more nutrients that are immediately available to plants. A wide range of agricultural residues, such as straw, husk, leaves, stalks, weeds etc can be converted into vermicompost. Other potential feedstock for vermicompost production are livestock wastes, poultry litter, dairy wastes, food processing wastes, organic fraction of MSW, bagasse, digestate from biogas plants etc. Earthworms consume organic wastes and reduce the volume by 40–60 percent. Each earthworm weighs about 0.5 to 0.6 gram, eats waste equivalent to its body weight and produces cast equivalent to about 50 percent of the waste it consumes in a day. The moisture content of castings ranges between 32 and 66 percent and the pH is around 7. The level of nutrients in compost depends upon the source of the raw material and the species of earthworm. There are nearly 3600 types of earthworms which are divided into burrowing and non-burrowing types. 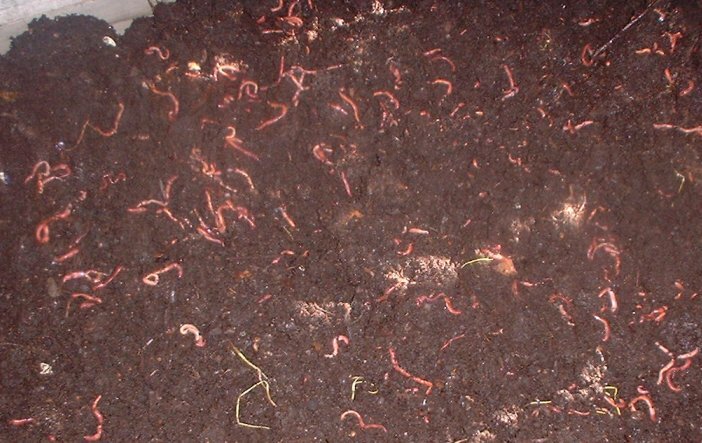 Red earthworm species, like Eisenia foetida, and are most efficient in compost making. The non-burrowing earthworms eat 10 percent soil and 90 percent organic waste materials; these convert the organic waste into vermicompost faster than the burrowing earthworms. They can tolerate temperatures ranging from 0 to 40°C but the regeneration capacity is more at 25 to 30°C and 40–45 percent moisture level in the pile. The burrowing types of earthworms come onto the soil surface only at night. These make holes in the soil up to a depth of 3.5 m and produce 5.6 kg casts by ingesting 90 percent soil and 10 percent organic waste. The types of vermicomposting depend upon the amount of production and composting structures. Small-scale vermicomposting is done to meet personal requirements and farmers/gardeners can harvest 5-10 tons of vermicompost annually. On the other hand, large-scale vermicomposting is done at commercial scale by recycling large quantities of organic waste in modern facilities with the production of more than hundreds of tons annually. The worm castings contain higher percentage of both macro and micronutrients than the garden compost. Apart from other nutrients, a fine worm cast is rich in NPK which are in readily available form and are released within a month of application. Vermicompost enhances plant growth, suppresses disease in plants, increases porosity and microbial activity in soil, and improves water retention and aeration. Vermicompost also benefits the environment by reducing the need for chemical fertilizers and decreasing the amount of waste going to landfills. Vermicompost production is trending up worldwide and it is finding increasing use especially in Western countries, Asia-Pacific and Southeast Asia. A relatively new product from vermicomposting is vermicompost tea which is a liquid produced by extracting organic matter, microorganisms, and nutrients from vermicompost. Unlike vermicompost and compost, this tea may be applied directly to plant foliage, reportedly to enhance disease suppression. Vermicompost tea also may be applied to the soil as a supplement between compost applications to increase biological activity. Vermicompost may be sold in bulk or bagged with a variety of compost and soil blends. Markets include home improvement centers, nurseries, landscape contractors, greenhouses, garden supply stores, grocery chains, flower shops, discount houses, indoor gardens, and the general public.